Cindy Paine is offering you that opportunity! You will spend the year being completely supported by Cindy, the other group participants and Cindy’s Team of Extraordinary Inspirational Speakers… making it almost impossible for your dreams and desires not to come true! Cindy Paine is the founder of the Clear-Connect-Create Method. Her book, Clear-Connect-Create: A Powerful Path to Self-Love, is the definitive work on self-love and the culmination of Cindy Paine’s life’s work and passion. 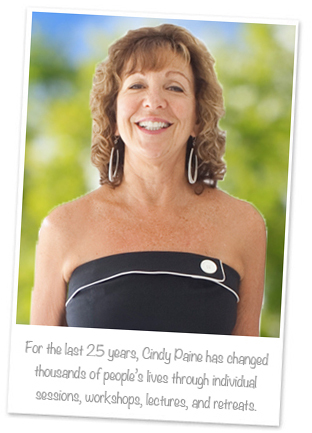 For the last 25 years, Cindy has changed thousands of people’s lives through individual sessions, workshops, lectures, and retreats. She has coached individuals and couples with the Clear-Connect-Create Method helping them transform their lives, their relationships, careers, finances, and health and well-being. It’s time to stop talking about changing your life and take action! Manifest your true desires and be supported all year long by Cindy Paine, the members of your group, and Cindy’s guest speakers. Contact Cindy Paine 773-852-4083 or cindy@cindypaine.com for a Free consultation to see if this program is a fit for you!